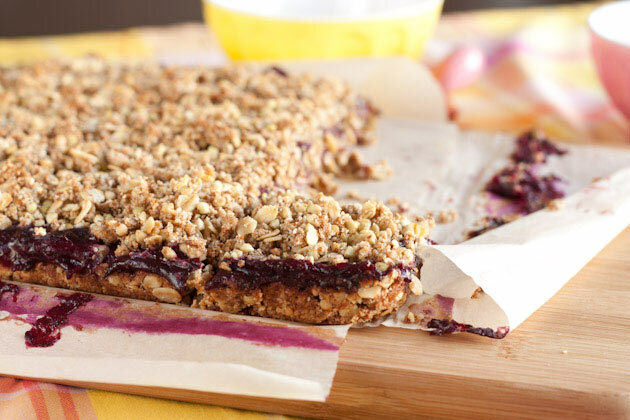 Light, sugar free bars with a crunchy buckwheat topping. 1 granny smith apple, diced small – keep skin on! Preheat oven to 375F and line 9×9 square pan with parchment paper across both sides for easy lifting and set aside. In a small bowl, mix arrowroot with warm water to form a paste. Set aside. Berry Filling: combine the berries, apple, apple juice, coconut sugar, stevia and vanilla extract in a blender and pulse quickly. Transfer mixture to a small saucepan and bring to a boil. Reduce heat and simmer for 5 minutes. Remove from heat and stir in the pre-mixed arrowroot mixture. Whisk until all clumps are gone and set aside. Base: Grind half of the buckwheat groats in a food processor or coffee grinder. Pour mixture into a large bowl and add remaining buckwheat, oats, almond flour, coconut sugar, cinnamon, baking soda, baking powder, stevia, and salt. In a separate bowl, mix flax egg, coconut oil and vanilla. Pour wet into dry and mix until combined. It will be slightly dry, but keep mixing with hands until it’s incorporated. Drop 2/3 of the mixture into the prepared pan and push down firmly with fingers to smooth out. 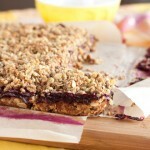 Grab the prepared berry filling and spread over the top of the base until smooth. Now, crumble the remaining oat mixture on top. Bake for 30 minutes or until the top is slightly golden and firm. Allow to cool for at least 20 minutes before cutting into squares. Generally flax eggs are comprised of 1 tablespoon flax and 3 tablespoon water, but use 2 tablespoon in this recipe. It’s not a typo!